View of AES from barrio Jobos in Guayama, Puerto Rico. 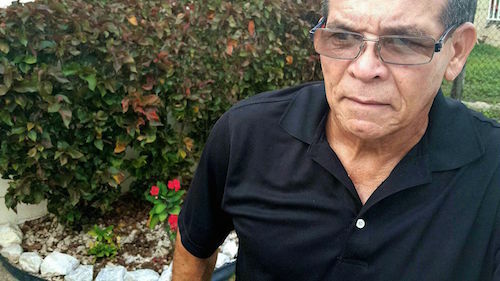 They went looking for Víctor Rodríguez Aguirre to his home in the Santa Ana sector of barrio Jobos Guayama. He was a critical player. The young father was resident in one of the most densely populated zones near the AES carbon plant and knew what it was like to live in poverty. He became a local sports leader who strived to help his community move forward. He focused particularly on young students with no job prospects on the horizon. His desire for progress and his influence in the neighborhood were key to convince others to believe in the promise that AES would invest hundreds of millions of dollars in the construction of a power generating plant that would bring wages and prosperity to the region. “They took us to Hartford, Connecticut, to see the AES facilities,” Rodríguez Aguirre recalled sitting in a chair in the balcony of his home. “And what we saw there was very positive; it was in line with what we had been told would be established here in Puerto Rico,” he said. But the enthusiasm didn’t last long. From Barranca and Pozuelo to Puente de Jobos and from Miramar to San Martin, and even in Los Mosquitos, disappointment spread quickly among neighbors like the smoke left behind by the truckloads of ash. “Even the smallest alleys were filled completely with the ashes. Then they covered it with white stone and other materials to hide it,” Rodríguez Aguirre lamented. “That’s not what was promised. The ashes were not supposed to be left here in Puerto Rico. That’s the reason why everyone thought it would be positive, that it was worth it,” he said. This all happened while the Puerto Rican government and federal agencies looked the other way. Unloaded coal ashes in Cimarrona sector, Guayama, Puerto Rico. When you dig soil, build a fence or plant a garden in the courtyard of a newly built home in some of the aforementioned municipalities it is common to unearth thick layers of gray dust. AES, the multinational corporation that produces the ashes since 2002 and bills nearly a million dollars daily to government owned Puerto Rico Electric Power Authority (PREPA) for the sale of coal based electricity, argues that they are not toxic waste and that they are safe for citizens and the environment. Company executives sustain that the Environmental Protection Agency (EPA) lists the ashes as non-hazardous waste and indicates that they can be reused as a filler in construction projects. Nonetheless, four years ago that same federal agency ordered and paid for a chemical analysis that debunked this thesis in response to complaints from environmental groups such as Diálogo Ambiental. 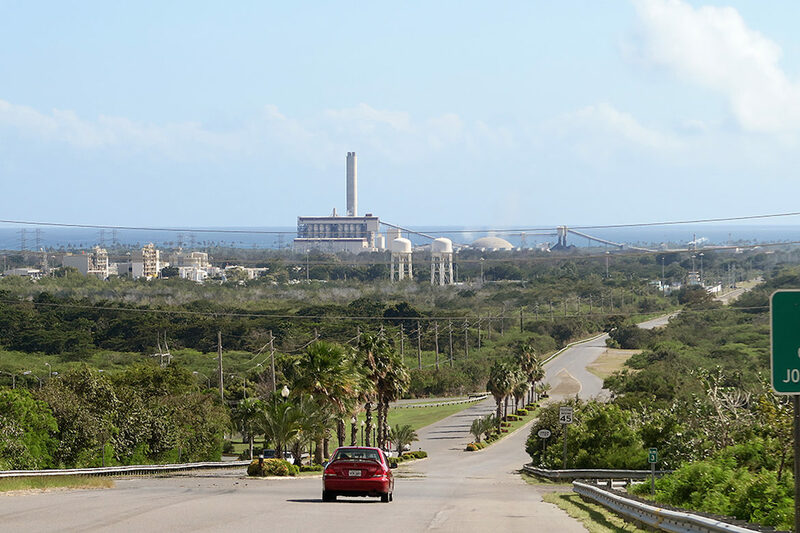 The research conducted exclusively with coal ash from the AES plant in Guayama concluded that this waste tends to release heavy metals in concentrations that exceed up to 9,000 times federal safety standards upon contact with liquids and soil. Researchers at Vanderbilt University in Tennessee and ARCADIS laboratories in North Carolina also detected excessive levels of arsenic, boron, chloride and chromium among these metals. As well as harmful traces of lithium, molybdenum, selenium and thallium. With these qualities and concentrations, EPA could classify AES waste -or any similar one- as a dangerous, toxic and carcinogenic substance. But it did not. Neither the EPA nor its homonymous local agency, the Environmental Quality Board (EQB), reported these findings to the plant’s neighbors or to the communities impacted by the transportation and unloading of the material. Instead, the EPA integrated some references to the report in its website and to this day the agency only provides the final study upon request. There is strong evidence on the effects of high concentrations of heavy metals on human health and the environment. For example, the Technical University of Delft in the Netherlands, one of the most prestigious research centers in Europe, points out that the intake of inorganic arsenic can intensify the chances of developing of skin, lung, liver cancer and lymphoma. Very high exposures can also cause infertility and abortions in women, damages to the brain, even to the DNA. On the other hand, thallium detected on the ashes of Guayama -in concentrations 14 to 31 times above the maximum allowed- can be absorbed by the body very effectively through skin, respiratory organs and the digestive tract, as deduced from the Vanderbilt and ARCADIS and the Technical University of Delft studies. Used as one of the active ingredients in rat poison, thallium intake can cause nerve and congenital damage in children and even death. The chemical analysis commissioned by the EPA also found that the ashes of AES can issue chromium concentrations between 470 to 9,000 times above the acceptable threshold. Previous studies, such as the one funded by the United States Department of Energy in 2006, have agreed that 97 percent of the total chromium released by coal ash is of the hexavalent type, a highly toxic compound. View from inside the AES plant. Better known by its reference in the film “Erin Brockovich”, water contaminated with hexavalent chromium caused cancer to animals according to laboratory tests conducted by the National Toxicology Program of the US Department of Health between 2006 and 2008. Due to its constitution, coal ash is water soluble so it is common for the substance to pollute aquifers, streams or rivers, and can even be assimilated by plants, fish and humans, according to Chemistry PhD. Osvaldo Rosario López. Rosario López, a professor at the University of Puerto Rico, has a specialization in EPA Environmental Chemistry, worked for a decade as a consultant to the federal Food and Drug Administration (FDA) and has spent 35 years as a researcher. Photos and documents held by Puerto Rico’s Center for Investigative Journalism (CPIPR in Spanish) detail how this toxic waste ended up in at least 36 locations in Santa Isabel, Salinas and Guayama. Among them are the developments Parque Gabriela II, Valles de Salinas, Marbella, Vistas de Salinas, Estancias de Dulces Sueños, Mar del Caribe and Villa Serena. The ashes were also deposited in commercial spaces such as Arboleda Shopping Court, Porto Fino Plaza, Los Recreos Plaza and Arroyo Town Center. Also a plot of land belonging to the Eta Sigma Alpha fraternity, near Punta Guilarte Beach and close to three water wells, was also classified as flood zone. Some images confirm the widespread disposal of toxic material at the banks of the Saco and Guamaní rivers. On the other hand, a source who asked not to be identified told the CPIPR that tons of ashes from AES were buried between 2004 and 2008 on public land of high agricultural value, typically used for planting vegetables, and managed by the Land Authority of Puerto Rico in Salinas. The material was mostly used as filling for roads and in some cases, the greyish residue was not covered with another material. Even though the communities have complained neither the company nor government agencies have taken corrective action concerning the inappropriate disposal of this pollutant. AES executives, officials from the EPA, the Environmental Quality Board (EQB) and the Puerto Rico and federal departments of Justice have been advised of these complaints since September 2012, according to a Notice of Intent to Sue from the legal aid organization Public Justice. Meanwhile, AES has continued to produce toxic coal ash at a rate of 400 to 1,600 tons per day or about 300 thousand tons per year, according to their own estimates. A car can weigh between one and two tons, a fact that helps understand the magnitude of the company’s ash waste production. Given the light weight of the ashes and the type of cargo vehicles used, part of this waste ends up spread over the routes chosen to transport it from Guayama to landfills in Peñuelas and Humacao. These locations have received the waste without authorization or supervision of the Environmental Quality Board. 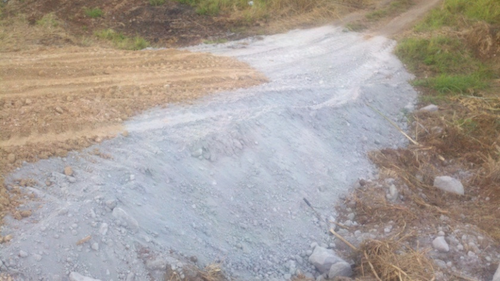 As recently as October 15, the EQB acknowledged in writing that during 2015 350 thousand tons in the Humacao landfill and other seven thousand tons of ash were illegally unloaded in the Peñuelas landfill. These violations have not resulted in fines or cancellation of permits and contracts. The questions of why regulatory agencies do not comply with their own laws or stop the dangerous disposition of toxic material around the island emerged again last year when another suspicion was confirmed. Researchers at Duke University in North Carolina certified that coal ash also has radioactivity levels up to ten times higher than the coal “due to the way the combustion process concentrates radioactive substances”, as published by the American Chemical Society magazine. “Right now there is no standard or safe level of exposure to radioisotopes. Any exposure is unacceptable,” said Rosario Lopez about the study. The findings and conclusions of the scientific team from Duke match another analysis done in 2010 where ashes of neighborhood Parque Gabriela in Salinas were evaluated. Test America Savannah laboratory certified not only toxic levels of arsenic, chromium, thallium, lead and molybdenum in this waste, but also excessive presence of alpha radiation. The EPA and the Centers for Disease Control and Prevention (CDC) recognize that when radioactive particles are inhaled the risk of cancer increases significantly. These particles disperse easily when handled, transported and unloaded without control mechanisms. According to the latest Cancer Registry of Puerto Rico Newsletter, the municipalities of Salinas, Coamo, Santa Isabel, Juana Díaz and Ponce recorded the highest incidence of all types of cancer between 2008 and 2012. Meanwhile, higher mortality was reported among people with cancer residing in Guayama, Salinas, Santa Isabel, Ponce, Guayanilla and Peñuelas. “Does the EPA know about all this (the radioactivity)?,” CPIPR asked Dr. Rosario Lopez. “Oh! They know. They know very well and coal company consultants also know it. They are also scientists,” he replied. According to references of the Public Justice organization, it would cost AES between $100 and $200 per ton to properly dispose of this waste, but the company has preferred to not take on that expense. Meanwhile, the pollutants from the ashes seep through the ground and the Southern Aquifer. As warned by Dr. Rosario Lopez, in all the places where they have used coal ash as a filler there is a threat of irreversible pollution with heavy metals. He believes it is “only a matter of time” before the toxic chemicals leak into water supplies like the Southern Aquifer until they make them unusable. 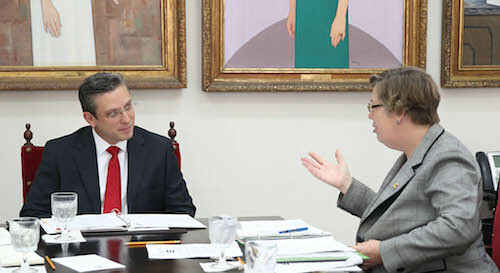 Governor Alejandro García Padilla meeting with Judith Enck in Puerto Rico. His remarks are not alarmist. An internal memo of the EPA obtained by the CPIPR shows how the administrator of the Region 2, Judith Enck, alerted on November 7, 2011 about this same issue to the president of the Environmental Quality Board, Pedro Nieves Miranda. Enck was concerned and mentioned Nieves Miranda specific cases and lawsuits filed in the US by contamination of aquifers with toxic elements in coal ash. This mention, however, is not the only one. EPA has profuse evidence on the pollution of aquifers and wells “leached” by coal ash in the United States, in particular with hexavalent chromium. For example, the federal agency found that the chromium present in an aquifer contaminated by an ash landfill in Ohio reached 1.68 parts per million, a figure that exceeds 84,000 times the amount allowed by federal regulations. In more well-known cases for residents of the United States -like those of Town of Pines, Indiana and Chesapeake, Virginia- important drinking water supplies were contaminated with coal ash that had been used as construction fill like in Puerto Rico. In 17 states there are about twenty cases tested and documented by EPA. At the same time the company investigates hundreds of additional complaints. Water extraction has been banned in places where chromium and other heavy metals contamination has been found. According to Puerto Rico’s chief adviser on water issues for EPA, Carl Axel Soderberg Mayoral, the Southern Aquifer is an elaborate network of drinking water wells that runs between the municipalities of Guayama to Peñuelas. At least 35 million gallons are extracted from it every day to serve around 140 thousand people and for residents and businesses in Salinas it is the only supply of drinking water. Although Soderberg Mayoral said that he was unaware of EPA studies where the toxicity of coal ash AES is recognized, he described the current state of the aquifer as critical due to salinization and acknowledged that posing another threat to this resource could be detrimental, not only for residents but also to the possibilities for commercial and industrial growth in the area. “The Southern Aquifer is in a critical situation… and therefore deserves special protection,” he said. He further argued that if the consumption from this water resource was ever banned “there will be a serious social economic problem,” especially for the municipality of Salinas. “Even if they look for money, where there’s none, in order to bring an alternate superficial supply, there would be extreme water rationing, permanently, having to bring in water though tanker trucks for several. There is nothing else to do,” he concluded. “It’s not whether it’s going to happen or not, it’s a matter of when will it happen,” Dr. Rosario Lopez insisted. 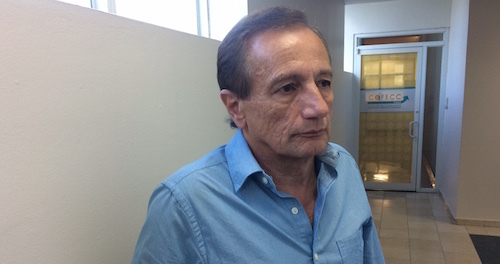 Manuel Mata, chief executive of AES Puerto Rico, did not agree to be interviewed by the Center for Investigative Journalism. In the third part of this series, the Center for Investigative Journalism reveals how the rules for company AES in Puerto Rico were changed backstage. 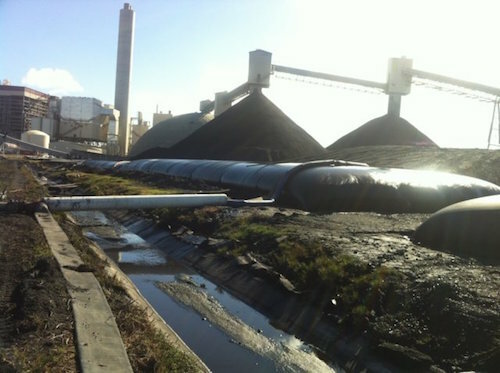 In addition, officials from government agencies react to the coal ash problem.